Many descendants of Louis and Guadalupe Rubidoux are buried at Evergreen. In the branch of the family descending from Louis Jr, Evergreen is home to Flavia Rubidoux, the wife of son Louis Jr.; Luvina, the first wife of grandson Andrew; grandson Peter T. Rubidoux, his wife Adelia, and children Mack Rubidoux, Lucy Rubidoux Smith, and Richard Rubidoux; and grandson Frank Rubidoux and his wife Anna. Another grandson at Evergreen, Adolpho Rubidoux, is descended from Rubidoux senior’s youngest son Abundo. The family name was originally Robidoux and Louis senior arrived in California in 1841, leaving his New Mexico home to live originally in Agua Mansa, where he brought his wife and infant daughter in 1844. By 1843, he had prospered enough to buy 6,700 acres from Juan Bandini, the owner of Rancho Jurupa, more than 32,000 acres of a Spanish land grant that Bandini expanded by another 4,500 acres until it encompassed both banks of the Santa Ana River from Prado Basin to Slover Mountain. In 1846, Rubidoux sided with the U.S. in the Mexican-American War and was taken prisoner after an attempt to join with American forces in Los Angeles. After his release in 1847, Rubidoux purchased another 6,700 acres and occupied a two-story adobe home near the corner of what is now Rubidoux Avenue and Mission Boulevard. The estate was called the Rubidoux Rancho. 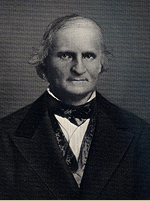 Rubidoux became a Justice of the Peace and one of the first three supervisors of what was then, San Bernardino County. His family ranched cattle and lived on the land until Rubidoux began to sell off ranch-sized parcels prior to his death in 1868. In 1869, the California Silk Association purchased the entire eastern section of the Rubidoux Rancho, 8,600 acres. French-born Louis Provost, a silk culture expert, and Thomas W. Cover, one of the five discoverers of the goldfield of Virginia City Montana, led the project to plant mulberry trees and capitalize on a bounty being offered by the California government for the production of silk cocoons. Provost’s untimely death and the cancellation of the bounty doomed the project, and just as the property was returned to the market, Cover approached John Wesley North and Dr. James P. Greves, who were in California looking for land on which to establish their Colony. North and Greves were persuaded and bought the land and Cover joined the colonists, intent on building the irrigation canal he had designed for the silk project. The Southern California Colony Association was formed with North as president, Greves as secretary, and Cover as superintendent of canal construction. The Rubidoux family continued to live on the ranch although many went to work in the growing city built on what had once been their land. Grandson Adolphe lists his employer as Frank Miller and his occupation as a tailor at the Mission Inn on his World War I draft registration and great grandson Richard lists himself as a physical tester for the Riverside Portland Cement Company. The earliest Rubidoux family burials are Flavia (also called Lana), Louis senior’s daughter-in-law and Luvina Rubidoux, who are buried near each other.